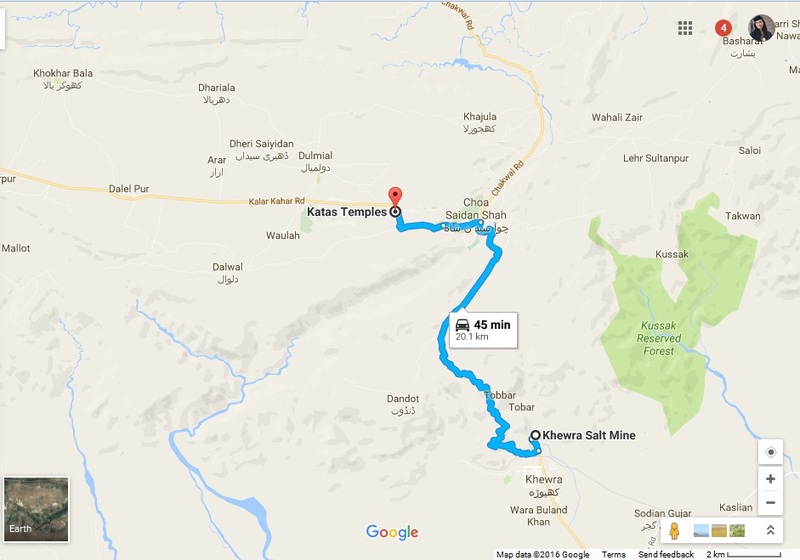 In my previous travel post I wrote about our office trip to Kallar Kahar and the Khewra Salt Mines. 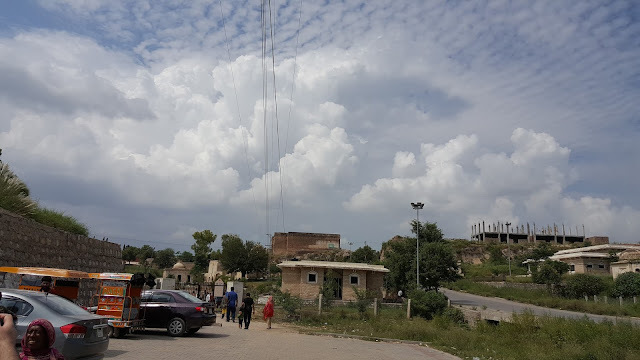 Well after that off we went to the Katas Raj Temples which equals 20 km and takes about 45 minutes of drive while it takes approximately 10 minutes less if you travel from Kallar Kahar. 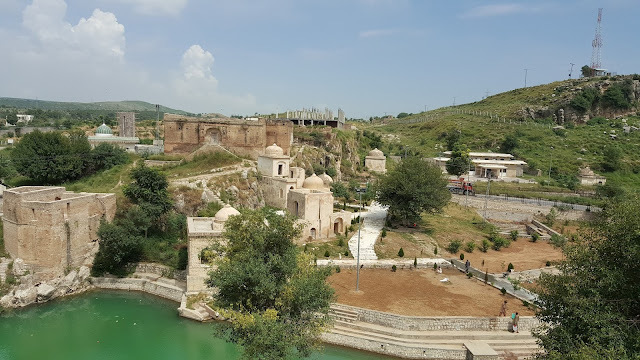 The Katas Raj Temples are located in the Chakwal District of Punjab (Province of Pakistan) at a place called Choa Saidan Shah. 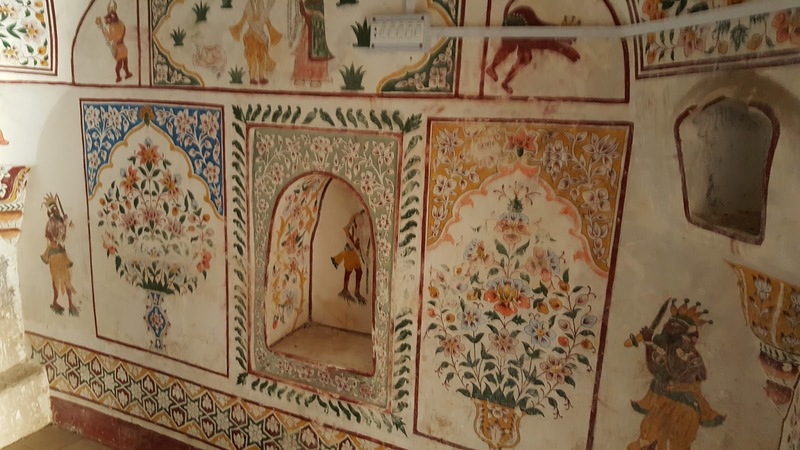 These are deemed highly sacred by our Hindu community; however, we Muslims don’t seem to have done enough justice as can be seen by the wall chalking and markings on the premises. 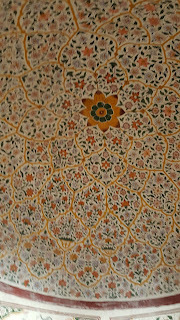 The tour guide present there told us that people have even dug up the ground within the temples in search of gold hence having the temples locked is reason enough for keeping the place safe. 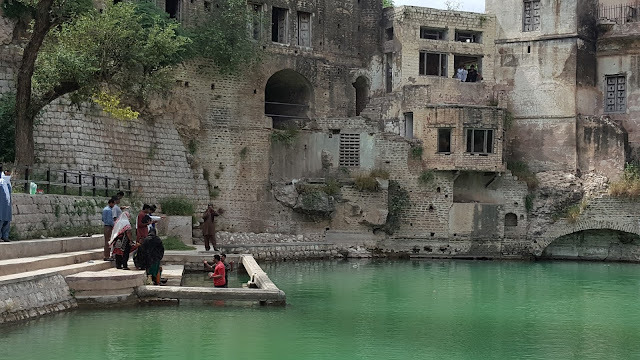 We were amazed by the well thought out construction and the clear emerald water in the very heart of this little Heaven. Ancient architecture compels you to think about how people were far more intelligent and artistic thousands of years back as these temples were built during 615 – 950 AED and house a history worth 1,500 years. 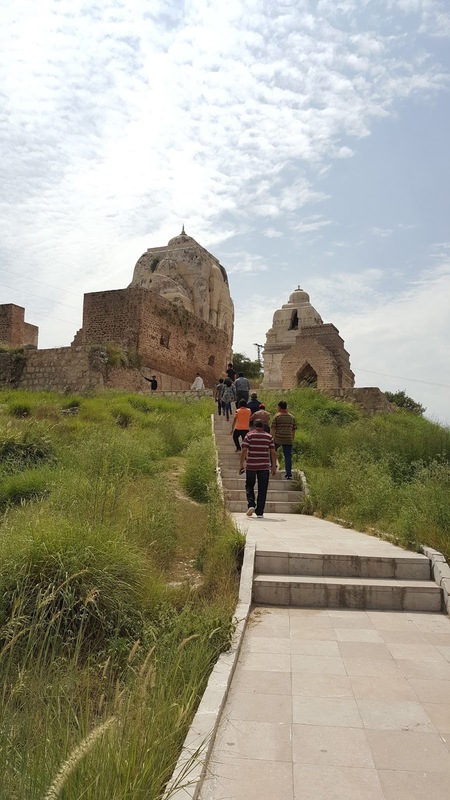 Hindu pilgrims the world over visit this sacred place during their Maha Shivratri Festival and regard it with outmost respect. 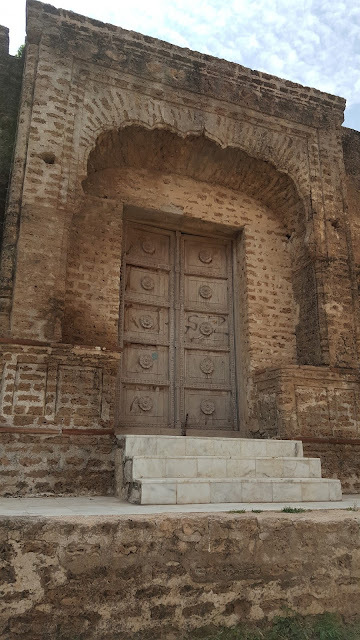 As per Alan Cunningham, the first Director General of the Archaeological Survey of India in 1872-73, after Jawala Mukhi, Katas Raj is considered to be the second biggest holy place in Punjab for Hindus. The Pandwas are said to have lived at Katas Raj for 12 years and built this wonder. 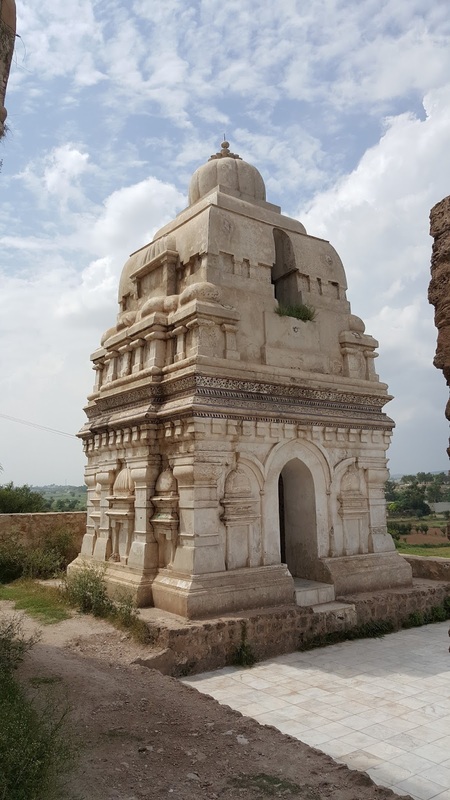 Located here was the Satghara, a term used for the cluster of seven temples within this site, however, only four of the mentioned temples remain today. 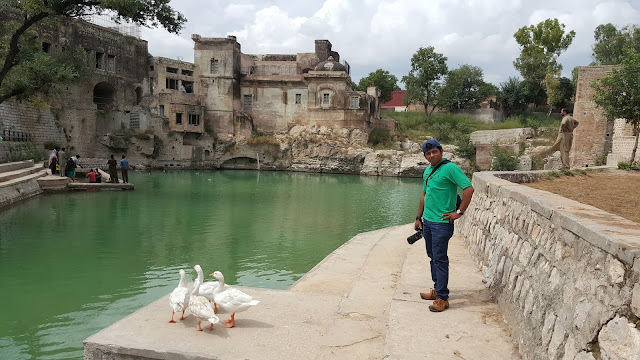 These surround a vibrantly, beautiful emerald pond; according to a famous legend, it was formed by the tears that Lord Shiva shed upon the death of his wife, Sati. 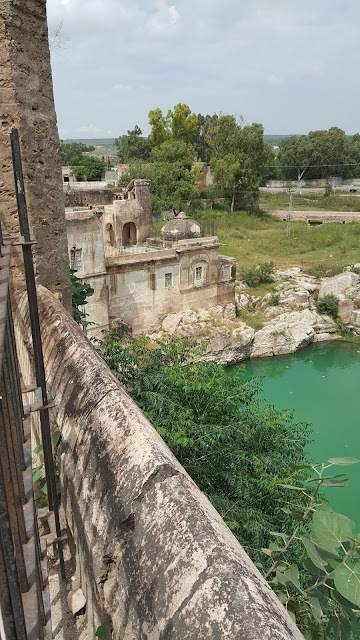 Meanwhile, the other pond through the very same tears was formed at Pushkara, near Ajmer. 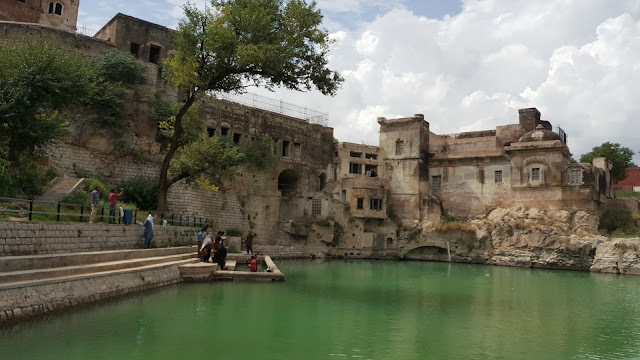 It is said that the water of Katas Raj Temples’ pond has healing powers and also washes away a person’s sins. 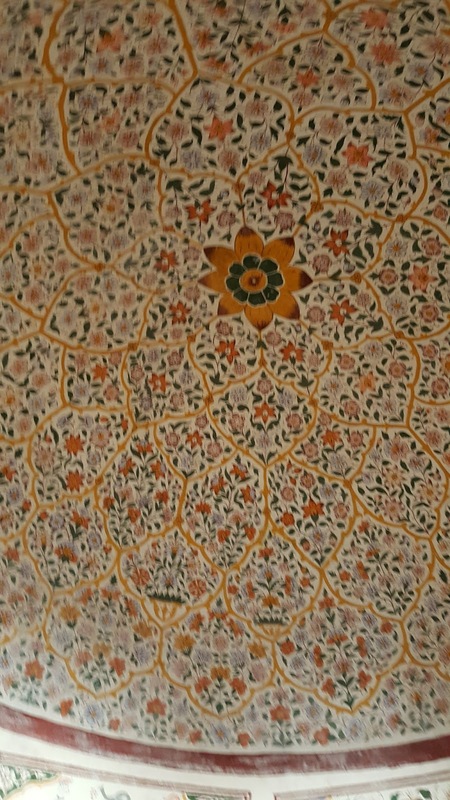 I wonder how it has remained so pure and clear all these years, adding a serene aspect to life around. On our way to these temples we could see smoke emanating from a far off corner of the lush green landscape which seems odd considering the natural aspect of the entire place. It was later revealed that the smoke was that of a cement factory. 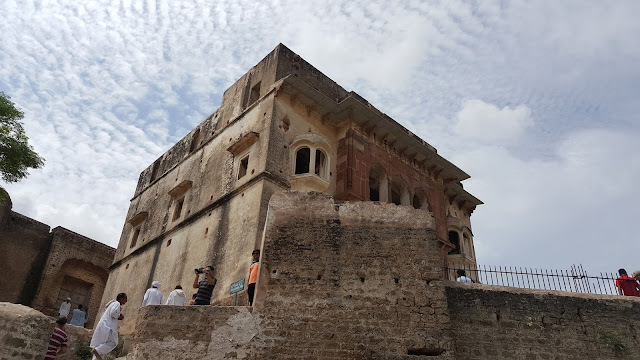 As we approached our destination, we were taken aback by the site’s architectural magnificence and the natural splendor that complimented it completely. Although the time we could afford to spend here was just 30 minutes, we stretched it to 45 minutes which still turned out to be insufficient considering a lot that needed to be explored, you need at least half a day starting from the morning to let the grandeur sink into you. 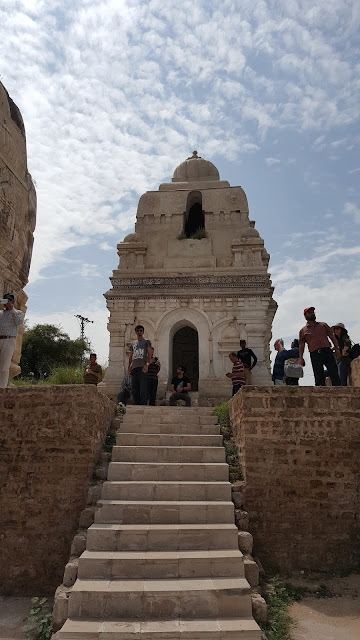 The tour guide at Katas Raj was generous enough to unlock some of the temple gates for us to visit as we went inside and all the way to the rooftop to witness what it’s like being a bird perched on top of the temples. Although it was pretty hot outside, the temperature inside the temple we went to was cool and calming which again made us fall in love with the builders’ thought provoking stance and intelligence. There are some leftover carvings and some futile yet sincere attempts to restore the place, of course not possibly to it’s original position but up to a decent level in order to respect a place of worship for our Hindu community, yet attracting tourists at the same time. 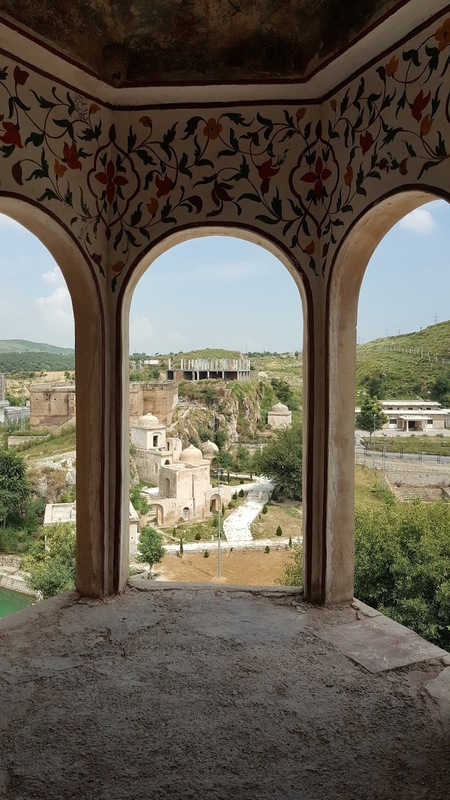 No matter what angle you look at the Katas Raj Temples from, the view is always incredible! P.S: All pictures have been taken with my Samsung Galaxy Note 5. A beautiful description of Katas Raj Temples. Reading this post gives a feeling as if the reader is also part of your journey and is enjoying the view of every corner of these temples. Pakistan can be such agreat tourist destination but unfortunately government never focused in this direction. Thank you for the appreciation! 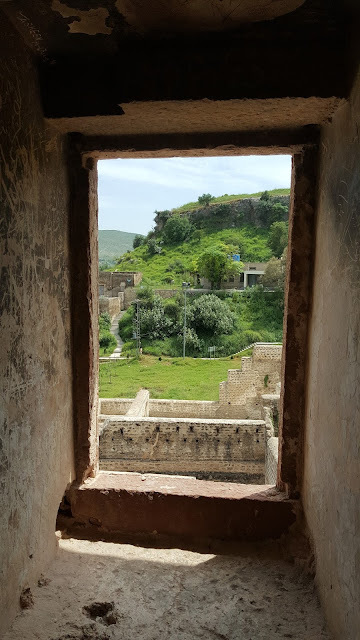 Yes indeed, Pakistan is a very beautiful country and one should explore it before going elsewhere. The government too needs to focus on awareness building and revenue generation through tourism. its so beautiful. I dint know of this place before you told me. 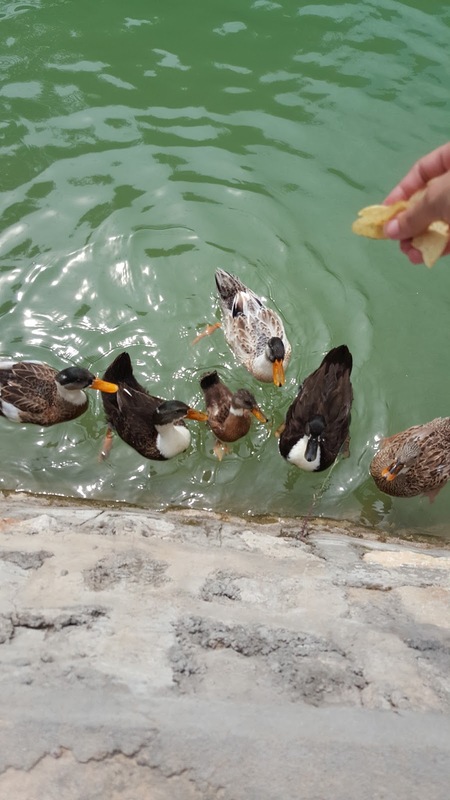 thanks for this blog post. 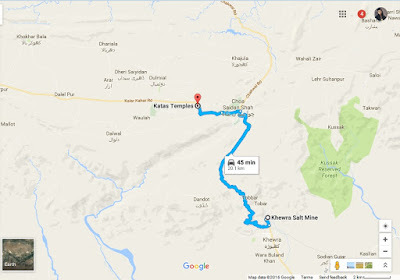 now its on my list of places to visit next.